An anti-intersectional “feminism” in which we are described as a “side issue” is many things, but it’s not feminist. Unsurprised but still a bit disgusted, we have been watching the past few days as white feminists have described us and our daily experiences as “lone wolf” debates, “side discourses” and “special interests.” In contrast to the protests in the USA, we were unable to get our voices as Muslim women to the podium, nor were the voices of other marginalized women represented there. Therefore we would like to collectively take a stand here. On Saturday, in Vienna as in many cities around the world, a Women’s March took place. The goal of the Women’s March on Washington was to send a clear message on the Trump government’s first full day in office. Worldwide, millions of people- amongst them women, people of color, Muslims, women refugees, LGBTQIA+ persons, immigrants, and workers- raised their voices against the patriarchy. In Vienna, the Women’s March was organized by an American woman and an Austrian activist. During the course of the preparations other organizations became involved in the planning, amongst them the women’s wing of the (Austrian) Green Party, the Austrian “Frauenring” (a network of women’s organizations), Democrats Abroad, Platform 20000 Frauen, One Billion Rising, and WAVE, as well as the Neue Linkswende. However, no immigrant organizations, representatives of the LGBTQIA+ persons of color communities, of the Black community, Trans persons, refugee women, disability activists or women of color collectives were involved in the organization. Nor were any women of color included as speakers. It seems the only attempt to introduce “diversity” into the speakers lineup occurred in the form of a Muslim speaker, Amina Baghajati, who was initially invited and included in the lineup of speakers on the march’s Facebook planning page. She was later uninvited by a member of the ranks of the Green Party women’s wing who was part of the march’s steering committee. On the event’s Facebook page, it was reported that the speaker was “unable to attend,” leaving the impression that she had canceled herself at the last moment. But after activists from Network for Muslim Civil Society spoke directly with Baghajati and offered a replacement speaker, it became clear that the cancellation was not on the part of Amina Baghajati but rather had been issued by the march’s planning committee. A few hours earlier in the day, upon the announcement of Baghajati’s being “unable to attend,” the organizers did not accept the offer of a replacement Muslim feminist speaker, but stated that a new person could not be added to the speaker list so close to the march time as it could cause tensions. That led to a series of protests on the Facebook Event page of the march with the hashtag #whyIcannotmarch, with the result that Muslim women who had planned to attend the march did not do so. This is not about the defense of the specific individual who was invited (and then uninvited!) to speak from her perspective as a Muslim woman. However, it is indefensible to us that a Muslim woman speaker was listed on the speakers’ list, and then later excluded and explicitly uninvited by members of the organizing committee. Those who stoked anti-Muslim speech in the planning of the march, which resulted in the written cancellation being sent, have been and continue to be systematically protected. Thus far, there have not been any statements by the main organizers about the content of the internal interventions against the Muslim speaker. It’s not the first time that black and other women of color have been portrayed as aggressive or overly emotional because they condemn exclusionary practices by white feminists that negate the lived realities of people of color. When they turned away the offer of a replacement speaker, we saw how seriously we should take the “solidarity” that the organizers expressed in their statement in actual political practice. A March of the Privileged? Worldwide, women rose in solidarity to support their sisters, to support minorities and to send an unmistakable signal of unconditional solidarity. In her brilliant speech, Angela Davis pointed to evident historical continuities, and made it clear that an inclusive and intersectional feminist practice means that for all of us, we must join the resistance against racism, Islamophobia, anti-Semitism, misogyny, and capitalistic exploitation. As millions of protesters worldwide followed the intersectional agenda of the Women’s March, in Austria the women who are on the front lines of neoliberal, nationalist, authoritarian, creeping right-wing fire were excluded. As white women shamelessly spoke about and over women of color, the latter were dismissed by many as aggressive and emotional. Especially in light of Trump’s victory, increasing attacks and discrimination against minorities and Muslims in Europe, as well as the daily institutional and individual violence inflicted by white people which we, women of color, black women, and Muslim, headscarf-wearing women are confronted, a collaboration would have been necessary to underline the international agenda of the Women’s March. Care should have been taken in the early stages of the planning process to ensure that that marginalized groups were adequately represented in the organizational team and could have a voice in developing the march program and speaker list. Had that been the case, we could have talked about genuine solidarity. A white, feminist practice that (re)produces and places the interests of white, heterosexual, cis-gender, able-bodied women at the center, is inherently exclusionary and actually represents the “special interests” of the most privileged women amongst us. A feminist political practice in which racist, Islamophobic, sexist violence against women is described as “side debate” and in which black women, refugee women, people of color, LGBTQIA+ persons and Trans persons are not included is not a truly feminist practice as far as we are concerned. Not only the past few days, but the pervasive, historical, regularly-recurring experiences of black women and other women of color demonstrate the absence of intersectional practice in Austria. In the face of the global crisis of capitalism and the rise of authoritarianism and nationalism, the strands of patriarchal, racist, and anti-ecological structures converge. These structures are reflected most prominently in the recent rise of right-wing, conservative powers. In Austria, too, Trump-style populist politics are being acted out at the expense of Muslim women, and with that Muslim women’s efforts to achieve equal opportunities and self-determination are destroyed. Movements like Black Lives Matter and protests like Standing Rock manage to position themselves as simultaneously anticapitalist, intersectional, ecological social movements that live out a political practice that fights for social justice for all. This is the approach on which we must orient our own political practice. We don’t need people speaking on our behalf, diversity quotas, white intercessors or rescuers, tears, or above all, self-declared anti-racist positioning statements. We have no requests or questions and will not be deterred. Those who truly want to show real solidarity must accept the leadership and real decision-making power of women of color and Muslim women in political work. Solidarity means listening, accepting, and especially letting us speak, without coopting our knowledge and passing it off as your own. It is even more important for us to continue to create and maintain our spaces and to network internationally. This is why we will be holding a conference for activists in intersectional feminism in Vienna. 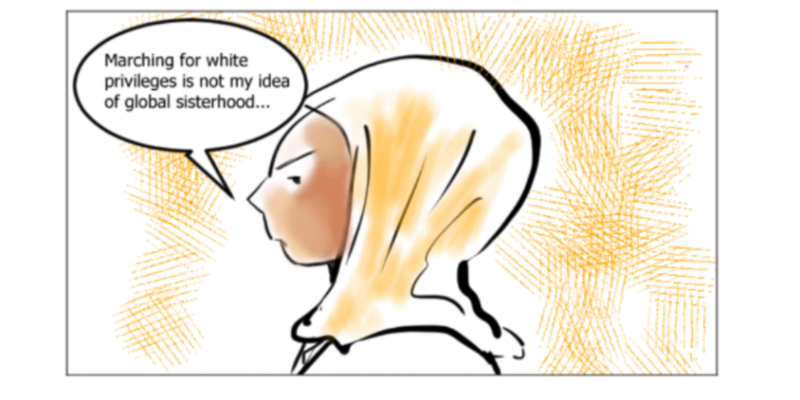 We, Muslim women, will fight in every battle against every kind of defamation and disempowerment. Our voices must be present in feminist discourse and space must be made for our concerns in civil society, the media, and political platforms. Under no circumstances do we want people to speak for us: we can speak for ourselves!. Show solidarity and stop silencing our voices! Eine anti-intersektionelle, ‚feministische‘ Praxis, in der wir als „Nebendiskurs“ bezeichnet werden, ist vieles, aber nicht feministisch. Mit wenig Überraschung und dennoch Abscheu, haben wir in den vergangenen Tagen verfolgt, wie wir und unsere alltäglichen Erfahrungen von weißen Feministinnen als „Eigenbrötlerdebatten“, „Nebendiskurs“ und „Partikularinteresse“ bezeichnet wurden. Da unseren Stimmen, aber auch den Stimmen anderer marginalisierten Gruppen, im Gegensatz zu den in Amerika stattgefundenen Protesten kein Gehör geschenkt wurde, werden wir hiermit als Kollektiv selbst Stellung beziehen. Am Samstag hat in Wien, wie auch in anderen Städten und Ländern, der Women’s March stattgefunden. Dieser setzte es sich zum Ziel, eine klare Botschaft an Trumps Regierung an ihrem ersten Amtstag zu senden. Millionen Menschen weltweit, Frauen*, Schwarze, MuslimInnen, geflüchtete Frauen*, People of Color, LGBTQIA+ Personen, MigrantInnen, ArbeiterInnen haben am Samstag ihre Stimmen gegen das Patriarchat erhoben. In Wien wurde der Women’s March von einer amerikanischen und einer österreichischen Aktivistin als Hauptorganisatorinnen veranstaltet, wobei im Zuge der Vorbereitungen die Grünen Frauen, der Österreichische Frauenring, die Plattform 20000 Frauen, One Billion Rising Austria, WAVE, die Neuen Linkswende und Democrats Abroad an der Organisation beteiligt waren. Es wurden dabei weder migrantische Organisationen, Vertreter*innen der PoC LGBTQIA+ Community, der Schwarzen Community, Transgender-Personen, geflüchtete Frauen*, Behindertenaktivist*Innen oder Kollektive von Women of Color in die Organisation involviert, noch waren WoC/Schwarze als SprecherInnen vorgesehen. Der einzige Versuch, eine quotenmäßige „Diversität“ innerhalb der Rednerinnen herzustellen, bildete eine muslimische Rednerin, die zuerst eingeladen und dann aus den Reihen der Grünen Frauen, die ebenfalls Teil der Organisationsvorbereitung waren, ausgeladen wurde. Organisatorinnen gaben zunächst an, dass die muslimische Rednerin selbst kurzfristig abgesagt habe. Nachdem jedoch Aktivistinnen des Netzwerk Muslimische Zivilgesellschaft bei der Rednerin anfragten und eine Ersatzsprecherin anboten, wurde klar, dass es sich nicht um eine Absage von Seiten der Rednerin, Amina Baghajati, sondern um eine der Organisationsvorbereitung handelte. Organisatorinnen wollten selbst so kurzfristig auch keine andere muslimische Aktivistin, die jedoch zuvor als Ersatzsprecherin angeboten wurde, sprechen lassen. Das löste auf der Facebook Event-Seite unter dem Hashtag #WhyIcannotmarch Proteste aus und führte dazu, dass Musliminnen, die den Marsch besuchen wollten, spontan davon absahen. Aufgrund dieser offiziellen Äußerung, dass es keine Ausladung seitens der Organisation gegeben hätte, wurden Musliminnen, die zurecht Kritik an der ausschließenden politischen Praxis übten, in sozialen Medien die Glaubwürdigkeit abgesprochen, während sich Weiße selbst als antirassistisch bezeichneten und diesbezüglich öffentliche Statements verfassten. Mehr noch werden muslimische Frauen* darauf hingewiesen, sich still zu verhalten, um eine weitere „Spaltung“ zu verhindern. Es geht hierbei nicht um eine Verteidigung der individuellen Person, die als muslimische Sprecherin angefragt und ausgeladen wurde. Doch ist es für uns unhaltbar, dass hier eine muslimische Sprecherin vorgesehen war, die von einem Teil der Organisationsvorbereitung mit einer klaren Absage ausgeschlossen wurde. Jene Personen, die islamophobe Diskurse in der Organisation schüren, in deren Konsequenz die schriftliche Absage erteilt wurde, wurden und werden weiterhin systematisch geschützt. Es gab zudem bisher keine Äußerungen seitens der Hauptorganisatorinnen zum Inhalt der internen, islamophoben Interventionen gegen eine muslimische Sprecherin. Es ist nicht das erste Mal, dass Schwarze Frauen*/WoC* als aggressiv oder emotional dargestellt werden, weil sie Praktiken des Ausschlusses ihrer Lebensrealitäten durch weiße Feministinnen verurteilen. Auch durch das Abweisen einer Ersatzsprecherin zeigt sich für uns einmal mehr, wie ernst gemeint eine im Statement der Organisatorinnen beschriebene „Solidarität“ in der politischen Praxis tatsächlich ist. Während Millionen Protestierende weltweit der intersektionellen Agenda des Marsches gefolgt sind, wurden in Österreich jene Frauen*, die in der vordersten Schusslinie des neoliberalen, nationalistisch, autoritären Rechtsrutsches stehen, ausgeschlossen. Während weiße Frauen* unbeschämt weiter über und anstelle von Women* of Color reden, wurden diese als aggressiv und emotional abgetan. Vor allem in Anbetracht von Trumps Sieg, zunehmenden Attacken und Diskriminierungen gegen Minderheiten und MuslimInnen* in Europa, sowie der tagtäglichen institutionellen und individuellen Gewalt durch Weiße, mit der wir als Women* of Color, schwarze Frauen* und muslimische, kopftuchtragende Frauen* konfrontiert werden, wäre so eine Zusammenarbeit nötig gewesen, um die internationale Agenda des Women’s March zu verdeutlichen. Bereits in der Vorbereitungszeit hätte sichergestellt werden müssen, dass marginalisierte Gruppen ausreichend im Organisationsteam vertreten sind und das Programm aktiv mitbestimmen. Erst dann wäre von einem Moment der echten Solidarität zu sprechen gewesen. Eine weiße, feministische Praxis, die Ausschlüsse (re)produziert und Interessen weißer, heterosexueller, cis-gender, able bodied Frauen* in den Mittelpunkt stellt, produziert Ausschlüsse und vertritt die Partikularinteressen der privilegiertesten Frauen* unter uns. Eine feministisch politische Praxis, in der rassistische, islamophobe, sexistische Gewalt gegen Frauen* als ‚Nebendiskurs‘ bezeichnet wird und in der schwarze Frauen*, geflüchtete Frauen*, PoC*, LGBTQIA+ Personen* und Trans-Personen* nicht eingebunden werden, ist für uns keine feministische Praxis. Nicht nur die letzten Tage, sondern die allgegenwärtigen, historischen, wiederkehrenden Erfahrungen von schwarzen Frauen*, Women* of Color sind Beweis für die fehlende intersektionelle Praxis in Österreich. Im Zuge der globalen Krise des Kapitalismus, dem Aufstieg von Autoritarismus und Nationalismus verdichten sich verstärkt patriarchale sowie rassistische und anti-ökologische Strukturen. Nicht zuletzt im Aufstieg rechter, konservativer Kräfte spiegeln sich diese Strukturen wider. Auch in Österreich wird populistische Politik im Trump-Stil auf dem Rücken muslimischer Frauen* betrieben, die alle Bemühungen der muslimischen Frauen für Chancengleichheit und Selbstbestimmung zunichte macht. Bewegungen wie Black Lives Matter, oder auch die Proteste in Standing Rock schaffen es jedoch, gleichzeitig als antikapitalistische, intersektionelle, ökologische, soziale Bewegungen eine politische Praxis zu betreiben, die für soziale Gerechtigkeit für alle kämpft. Es ist dieser Anspruch, an dem sich unsere politische Praxis orientieren muss. Wir brauchen keine Stellvertreterdebatten, Diversitäts-Quoten, keine weißen Fürsprecherinnen oder Retterinnen, keine Tränen und vor allem keine sich selbst als antirassistisch deklarierenden Stellungnahmen. Wir haben keine Bitten oder Fragen und lassen uns nicht irreführen. Wer in der Praxis solidarisch sein will, muss die Führung und Mitbestimmung durch Women* of Color, schwarze, muslimische Frauen* in politischer Arbeit akzeptieren. Solidarität bedeutet zuhören, akzeptieren und vor allem sprechen lassen, ohne sich unser Wissen anzueignen und als das eigene auszugeben. Es ist umso wichtiger für uns, Räume weiterzuführen und international zu vernetzen. Aus diesem Grund werden wir eine AktivistInnenkonferenz zu intersektionellem Feminismus in Wien abhalten. Wir, muslimische Frauen, werden in jedem Fall gegen jede Art der Diffamierung und Entmachtung kämpfen. Unsere Stimmen müssen in feministischen Diskursen präsent sein und unsere Anliegen auf zivilgesellschaftlichen/medialen/politischen Plattformen Platz haben. Wir wollen unter keinen Umständen, dass man für uns spricht, denn wir reden für uns selbst! Ergänzung zu unserer Stellungnahme: Auf Wunsch vom Kongress Polnischer Frauen in Österreich (Kongres Polskich Kobiet w Austrii) möchten wir richtigstellen, dass sie den Women´s March Vienna mitorganisiert haben. Sie wurden jedoch auf der Seite des Österreichischen Frauenrings, von der wir unsere Informationen über die Mitorganisatorinnen entnommen haben, als einzige migrantische Organisation nicht aufgelistet. Wie es aussieht richtete sich der Ausladung allerdings nicht gegen sie als Frau sondern gegen einige ihrer (selbst gewählten!) politischen und gesellschaftlichen Ansichten. Ein doch erwähnenswerter Unterschied! Wofür steht denn bitte das Sternchen hinter „Frauen“? Das sieht sehr nach Fußnote aus, ich kann aber keine finden und ein Gendersternchen ist es auch nicht. Wenn wir hier schon mal dabei sind, sich nicht vereinnahmen zu lassen: ich zähle als Schwuler mich nicht zu dieser ganzen Lgbt-Quatschveranstaltung mit Sternchen und Unterstrichen und ich bin sehr kritisch gegen den Islam und halte Religionskritik nicht für etwas rassistisches, da man sich ne Religion aussucht, während man bspw mit einer Sexualität geboren wird (hier wirds dann rassistisch, wenn man das kritisiert), bin mit meiner Sexualität geboren und halte Gender für absoluten Quatsch. Und es sind solche total durchgesternten, verstrahlten Texte, an denen man erkennt, dass der Feminismus langsam aber sicher untergeht. Inzwischen also weiße Feminisiten gegen religiöse. Interessant auf jeden Fall, dass der weiße Mann hier nicht mehr das Haupthassobjekt ist. liebe sado-maso-frauen aus dem 7.Jh.n.C. : kämpft in saudibarbarien mit intersektionellem feminismus für #ensclavingwomen, statt uns dies hier als feminismus und frauenbefreiung verkaufen zu wollen ! ich würde sehr gern nachvollziehen können wie das war. finde diese stellungnahme wichtig und informativ, aber mich würde noch interessieren welche positionen angefeindet worden sind? welche inhalte wurden von dem nmz für den redebeitrag vorschlagen? war die einzige begründung der ablehnung, dass nur 3 frauen sprechen werden?